Terrassa, Barcelona, ​​Badalona, ​​Sant Adrià de Besòs and Santa Coloma de Gramenet have made recounts of homeless people this week. These figures are added up to the ones already done previous years in Girona, Tarragona, Lleida, Mataró and Reus. 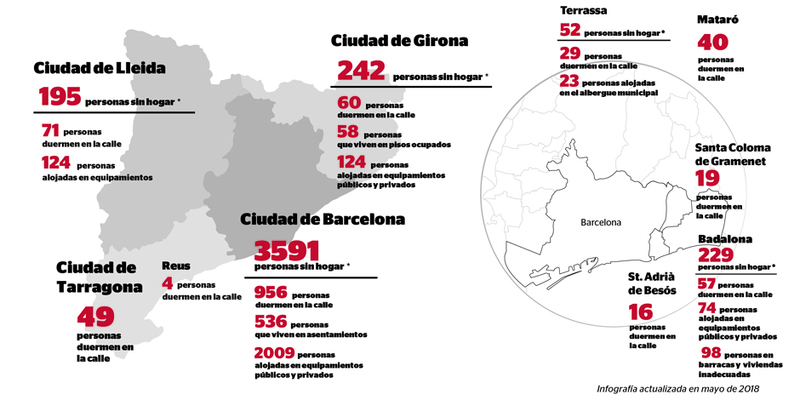 In Catalonia, we don’t have updated figures to size homelessness but we know that at least 1,301 people sleep on the street in these ten municipalities. The night of the 16 to the 17 of May, more than 1,200 volunteers have wander around the streets of Barcelona, ​Badalona, ​​Sant Adrià de Besòs and Santa Coloma de Gramenet to count how many people sleep outside. The night of the May 14th, in Terrassa, was done the same action. We have to bear in mind that figures are minimum numbers because it surely were more people that we didn’t found. In Terrassa, 52 homeless people were found (29 of them sleeping outside and 23 at the La Andana shelter) in the first recount organised in the city. 148 volunteers participated. In Barcelona, 956 people sleeping on the street were counted, a similar figure of the previous year and that means an increase of 45% compared with ten years ago. The districts with more located people are the Eixample, Ciutat Vella, Sants-Montjuïc and Sant Martí. Furthermore, we have to add up 2,099 people that have spent the night in different public and private residential resources and to 536 people that live in settlements. The action was driven from the Assisted Network of Homeless People, formed by thirty social entities and the City Council, and has count on the participation of 925 citizens. In Badalona, ​around 200 volunteers have gone out on the streets and have counted 57 people sleeping outside. 74 people at public and private facilities and 98 people in shacks or inappropriate housing. It is about the second recount organised in the city where were detected 18 more people sleeping on the street than in 2016. In Sant Adrià de Besòs 16 people were found sleeping on the street, under a deck or inside a vehicle. It is the third recount made in the city and has counted with the collaboration of 37 volunteers. In Santa Coloma de Gramenet, 51 citizens went to the street and located 19 people. It is about a similar figure of the one in December of 2017, where 20 people were counted. In the recounts made in the previous years, 71 people were located sleeping on the streets of Lleida, 60 in Girona, 49 in Tarragona, 40 in Mataró and 4 in Reus. In total, these ten municipalities represent 37.56% of the Catalan population and foster 1,301 people sleeping on the street. In 2015, the Parliament of Catalonia urged the Government of Catalonia to make biannual recounts to size homelessness. Currently, only these ten Catalan municipalities have gone out to count people that sleep outside. At Arrels, we think it is necessary a Catalan vision of homelessness and we have created a Practical guide to organise recounts and to encourage more municipalities to size the problem. The figures help to improve assistant services and to draft effective policies to make possible #nobodysleepingonthestreet.